After a bit of searching, I found an instrument cluster with the factory tachometer option (RPO U16) to swap into Dad's 77. There were numerous different versions of these clusters used over the years. I'm working on putting together an identification guide for them. 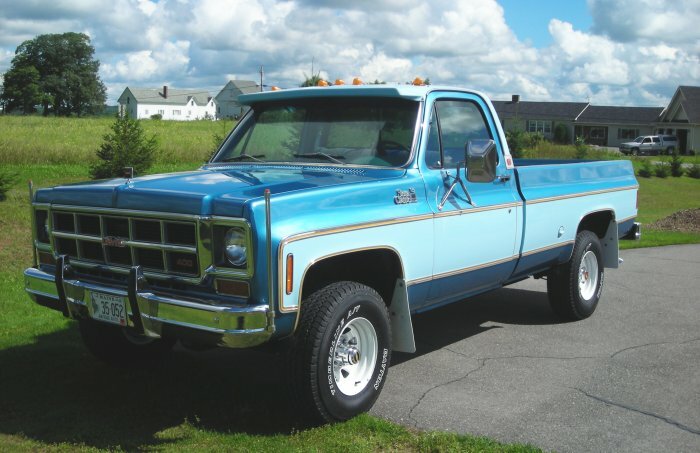 This particular cluster was chosen because it has a voltmeter and a mechanical oil pressure gauge, making it a direct plug-in swap for this truck which was already equipped with a similar RPO Z53 gauge cluster. 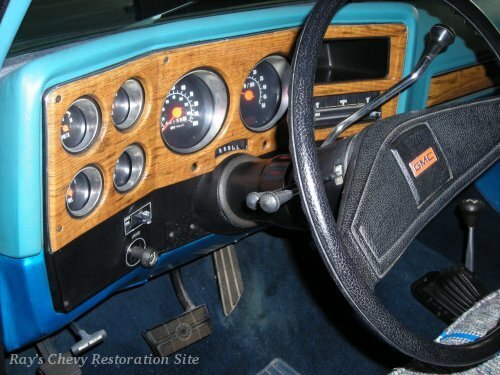 Swapping one of these factory gauge clusters (with or without the tachometer option) into a truck that was originally equipped with warning lights is a bit more involved. I'm working on a swap guide for that procedure. Replace the carpet and headliner ... they were already replaced several years ago but the replacements are too dark. 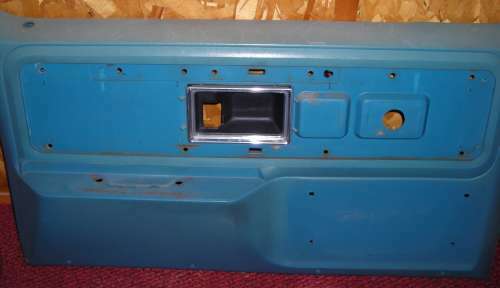 Dye the faded door panels and other trim pieces. Have the seat re-covered with original material ... the vinyl on the sides has started to crack and there is a rip in the cloth on the driver side. It's currently covered with an aftermarket seat cover but it's not a very good fit. Above: Driver side door panel before. Below: Same door panel after painting with the SEM Color Coat. The arm rest and map pocket were still in good condition and didn't appear to be faded too much so I didn't spray those pieces. The carpet on the bottom of the door is original un-dyed too. 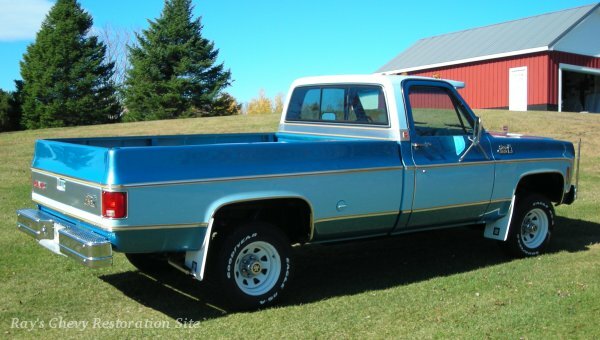 Most of the original trim that divided the two tone paint was in poor condition and was discarded when the truck was painted back in 1989. 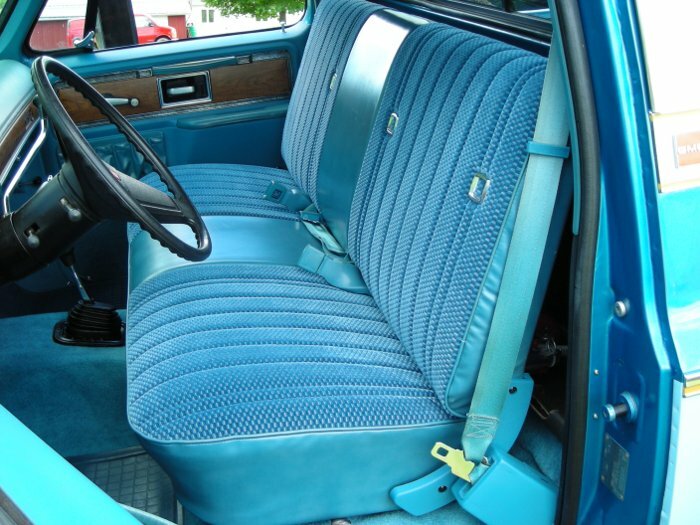 For 1977 only, GM used "ochre" (yellow) accent stripes on the trim instead of black. I think it may have been an anniversary year for GM trucks or something. 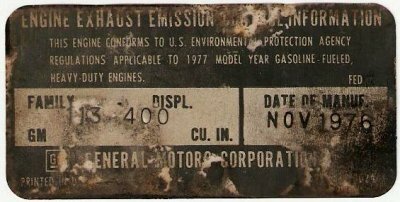 Anyway, Dad purchased many new pieces of trim from the local GM parts dealership years ago but had to get most of the pieces with the more common black stripes (used from 1973-76 & 78-80). I used some lacquer thinner to remove the black paint, spent a lot of time masking off the trim, and re-painted them with Nason Ful-Thane urethane in Bahama Yellow which is a very close match to the original ochre yellow. The paint job I sprayed on the truck last summer had a little bit of orange peel texture that I wasn't happy with. So I decided to do some sanding and buffing before installing the new trim and emblems. I wet sanded with 1500 grit followed by 2000 grit to remove the orange peel and dust nibs. Then I buffed the paint with Meguiar's #1 Medium Cut Cleaner followed by their #9 Swirl Remover to restore the shine. This was my first time sanding/buffing a paint job and I've since learned that the products I used are somewhat old technology compared to the newer products Meguiar's has to offer. Still, they seemed to do a good job in my opinion. A couple photos of the finished truck with all the new trim and emblems installed. We took the old 235/75R15 Bandag retreaded GoodYear tires off the truck and replaced them with a set of 31x10.50R15 Dayton Timberline A/T tires. The old Bandags were great snow plow tires but very noisy on the road. While the tires were off, I took the opportunity to sandblast the wheels and spray them with some epoxy primer followed by some Nason Ful-Thane urethane in the original shade of white. 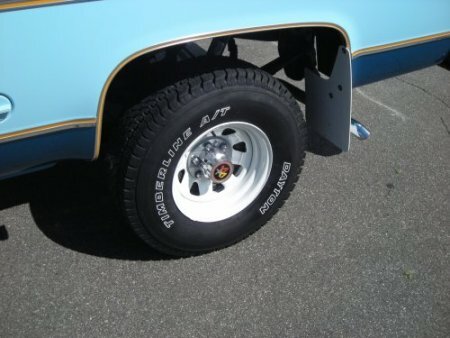 Although not original to this truck, these 15"x8" wheels are factory GM RPO-PA6 wheels. 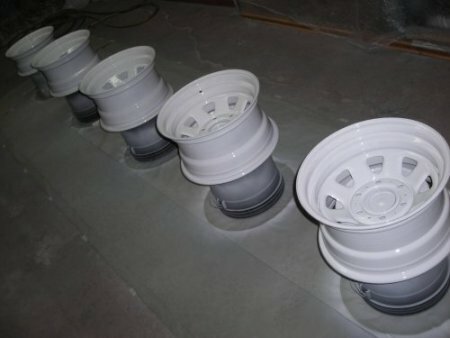 They can be distinguished from similar looking aftermarket wheels by the rounded/rolled edges of the triangular openings and the threaded center cap mounting holes. After storing the truck for the winter, we removed the seat and headliner and took them to the upholstery shop for repair. The headliner will be getting re-covered with some original type perforated vinyl. The seat will also be getting re-covered with original type vinyl on the sides and cloth on the seating area. Hopefully the upholstery shop can find a source for some of the original cloth. 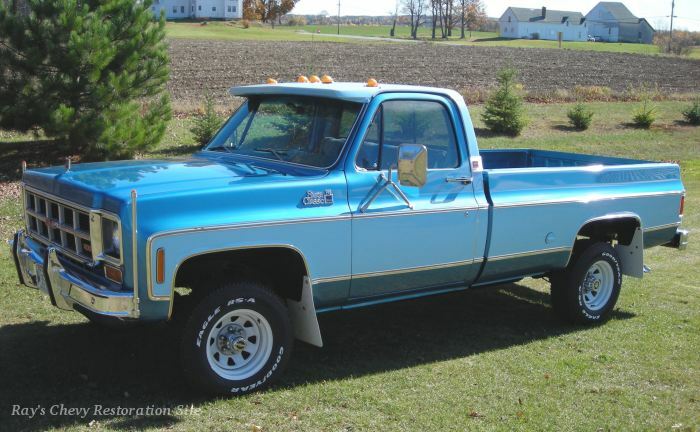 It's a ribbed pattern velour that (from what I've found) was only used in GM trucks for 2 or 3 years in the mid 70's. After months of searching, the upholstery shop was unable to find a match for the original seat cloth. The closest they found was from SMS Auto Fabrics. It was an exact match on the pattern but the color was way off (and kind of green looking) as compared to an un-faded section of the original where the back/bottom overlap. So we made the decision to to give up on trying to find an exact match and just go with some velour that we picked out of one of the upholstery shop's sample books. 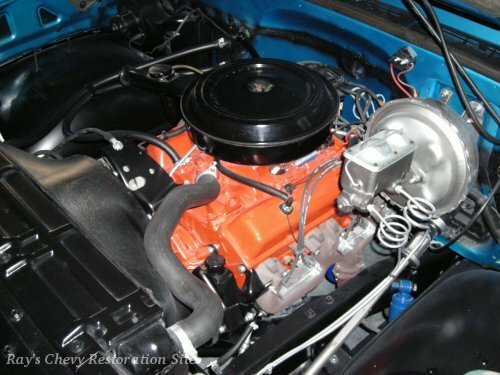 We found some that looks very similar to what GM used in the 78/79 trucks. In the meantime, we put the old aftermarket seat cover on a seat we pulled out of a parts truck and stuck that in there for the summer. The seat is back from the upholstery shop and looks great even though the cloth isn't the exact original style. We also got a new carpet made by Auto Custom Carpets, Inc. that will be going in along with the seat. 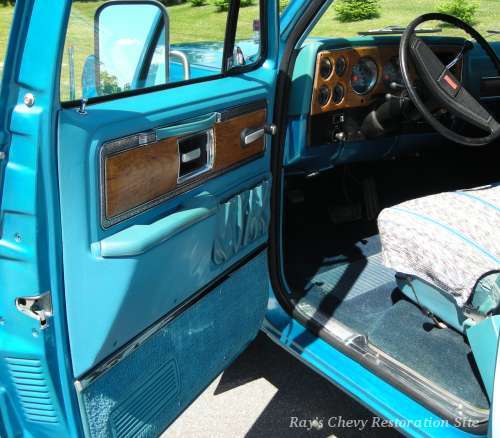 Their blue #802 cut pile carpet is a nearly perfect match to the original and matches the original lower door panel carpet a lot better than the darker blue carpet currently in the truck. We finally got around to installing the new carpet and re-upholstered seat. I freshened up the faded plastic on the seat hinge covers and the seatbelt retractor covers with SEM Color Coat. Still on the to-do list is replacing the headliner and spraying the headliner trim pieces and faded dash pad with SEM Color Coat. 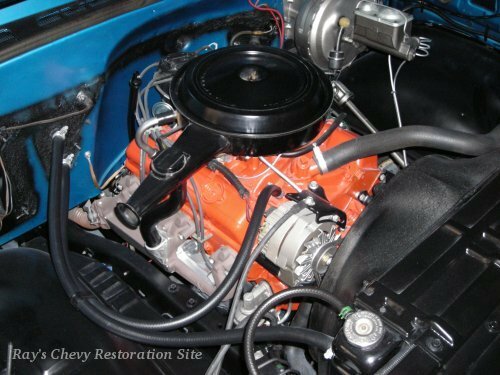 That will pretty much finish up the interior restoration work.